Vehicles have an important role in road transport. TN maintains a policy of permanent renovation of its fleet that allows to have modern vehicles equipped with the latest technological means. Other aspects considered relevant are the preservation of environment and safety, as an example, in the search of the latest generation of motors in order to reduce the emission of gases and polluted particles or using brakes ABS/EBS and pneumatic suspensions in our vehicles. 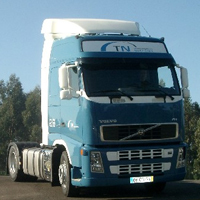 TN has a varied fleet which allows to satisfy the different specialities of each type of service, the serviceable capacity is about 2700tons, more than 1200tons are composed by prepared and approved vehicles to transport dangerous materials. All vehicles can perform national or international services.